Craigellachie Scotch Whisky Distillery was built in 1891 in the Speyside region of Scotland. The distillery produces the single malts Craigellachie 1984 and 14 Year Old brands. The address details for this distillery are Craigellachie Distillery, Craigellachie, Aberlour, Banffshire, AB38 9ST with the telephone number being +44 (0)1340 872970. 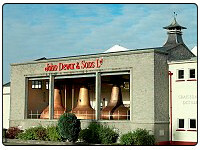 You can also view the single malts that are on offer from this distillery by clicking the below banner.